OFFERS VENDORS AND ATTENDEES MORE BANG FOR THE BUCK! Event organizer, Jam On Productions, announced plans to bring the International Motorcycle Show to the Showboat Convention Center & Hotel, January 11th thru 13th, 2019. The Convention Center is situated between the Hard Rock Hotel and Casino and the Ocean Resort Casino which have undergone billions of dollars in renovations. $300 cash door prize daily at 6 p.m. 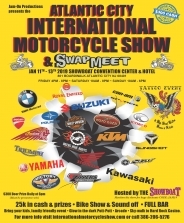 Interested vendors can secure space at the 2019 International Motorcycle Show in Atlantic City by contacting moc.w1556296850ohsel1556296850cycro1556296850tomla1556296850noita1556296850nretn1556296850i@ofn1556296850i1556296850 or call (386) 206-5276. Tell a friend cause if you cant come, bet you know two that can!! Miss Caroline is the Publisher and Editor of Fast Lane Biker Magazine Delmarva ("FLBD") since its inception in 2008. She holds dual degrees in English Language and Literature, and Business Administration. Her fascination with riding began as a child when she could often be found sneaking off with her brothers' dirt bikes. Her goal is to boost perception of motorcyclists and educate markets on the strength of the motorcycle community as consumers.